Hebrew miners at Serabit el-Khadim join Moses. The stop at Succoth was not to rest, it was to collect the Hebrew workers at the Egyptian controlled copper and turquoise mines Serabit el-Khadim. They travelled day and night by miracle. Two Egyptian copper/turquoise mines were in full operation in 1446 BC in the Sinai. 2. 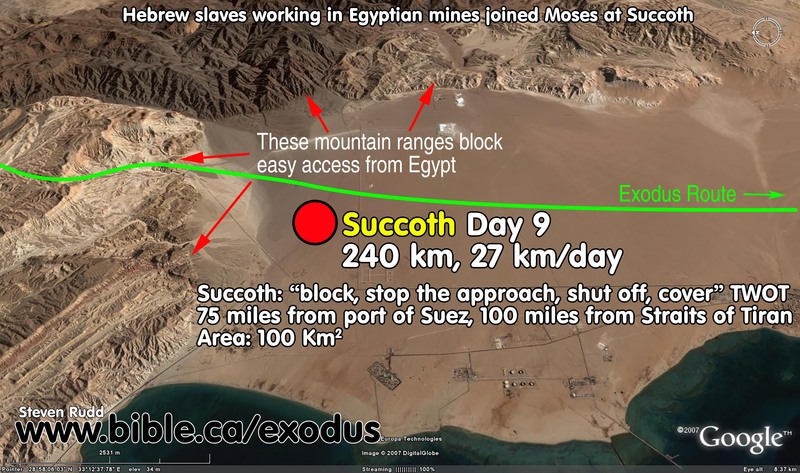 We have no idea exactly where Succoth is located, however we can get a clue based upon the name and the proximity of the Egyptian mines. 3. The stop at Succoth was not to rest, it was to collect the Hebrew workers at the Egyptian controlled copper and turquoise mines Serabit el-Khadim. 4. Today, there is a road that follows the valleys in the mountains between the beech and Bir Nasb, then continues to Serabit el-Khadim. This route is likely an ancient pathway used by the Hebrews and is only 20 km to Serabit el-Khadim. A. The Succoth Stop: Hebrew miners at Serabit el-Khadim join Moses. 1. The stop at Succoth was not to rest, it was to collect the Hebrew workers at the Egyptian copper and turquoise mines Serabit el-Khadim. a. 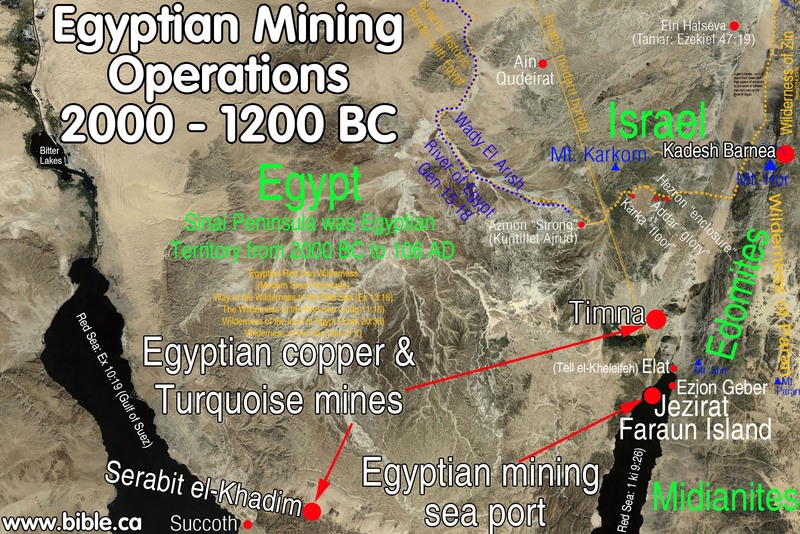 Two Egyptian copper/turquoise mines were in full operation in 1446 BC in the Sinai. 2. It is important to understand that Israel travelled day and night without stopping. 3. They likely stopped for brief food breaks to eat their unleavened bread. b. They did not stop to set up tents or sleep. c. This changes all the “how many miles did they travel in a day” calculations. d. See also: Travel times, distances, days of the week. 4. Several of the recently translated 16 “Sinai Inscriptions” document Hebrew life at Serabit el-Khadim. a. Pictured left above is Sinai Inscription #361 (dated to 1446 BC) which translates from Hebrew into English, “Our bound servitude had lingered. Moses then provoked astonishment. It is the year of astonishment because of the Lady [Hathor-the cow goddess]”. See details: Sinai Moses Inscription 361”. b. Pictured right above is Sinai Inscription #375a (dated to 1480 BC) which translates from Hebrew into English, “The overseer of Minerals, Ahisamach.” This Ahisamach is also named in the bible: Exodus 31:1–11. 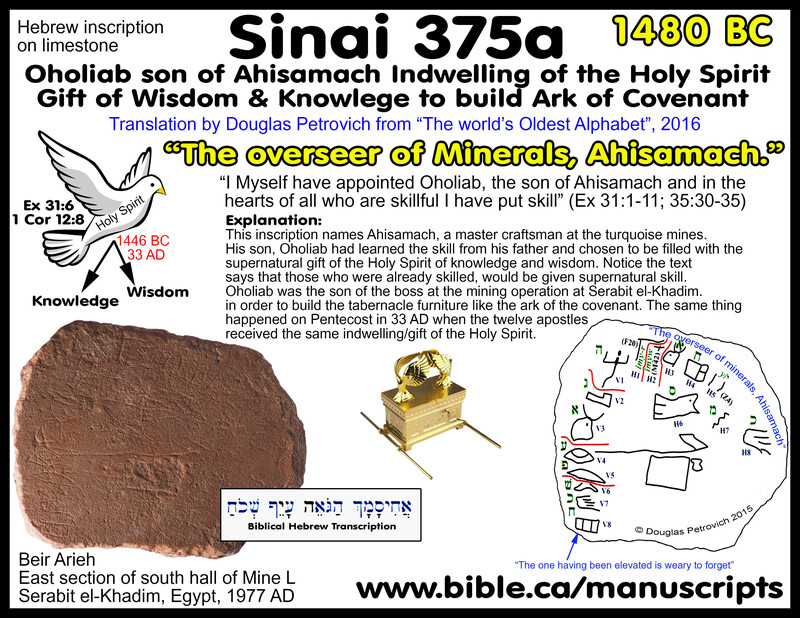 See details: Sinai Moses Inscription 361”. c. Sinai inscriptions #115, 345, 349, 353, 357, 360, 361, 375a, were all excavated by Flinders Petrie at Serabit el-Khadim in 1905 AD. d. The language was unknown and they sat in museums till Douglas Petrovitch recognized them as Hebrew and translated them in 2016 AD. 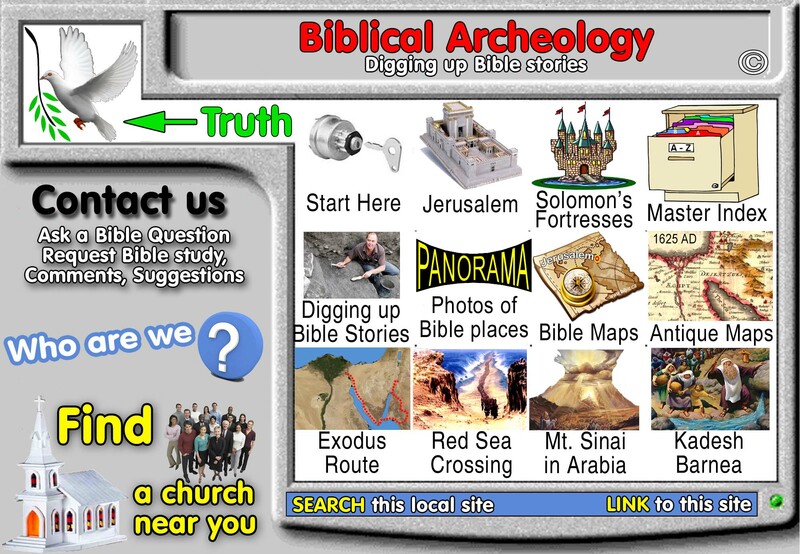 e. The now famous “Moses Inscription” (Sinai 361) is the first archeological confirmation of Moses ever to be discovered. f. The inscriptions are proof of a sizable slave population working at the mines. g. See also: 16 Sinai Inscriptions”. 5. Moses would know about this slave population working at the mine and he would certainly stop to collect the men. a. These men would have wives and children asking Moses to stop and get their husbands and fathers. b. Moses could send runners ahead of the main group to instruct them to start packing up and make the short trip. a. Succoth to the mines at Serabit el-Khadim: 20 km over mountains, 40 km around the mountains. b. Succoth and the mines at Bir Nasb: 12 km over mountains, 25 km around the mountains. c. This journey is an easy day trip for the slave miners to join Moses camped at Succoth. 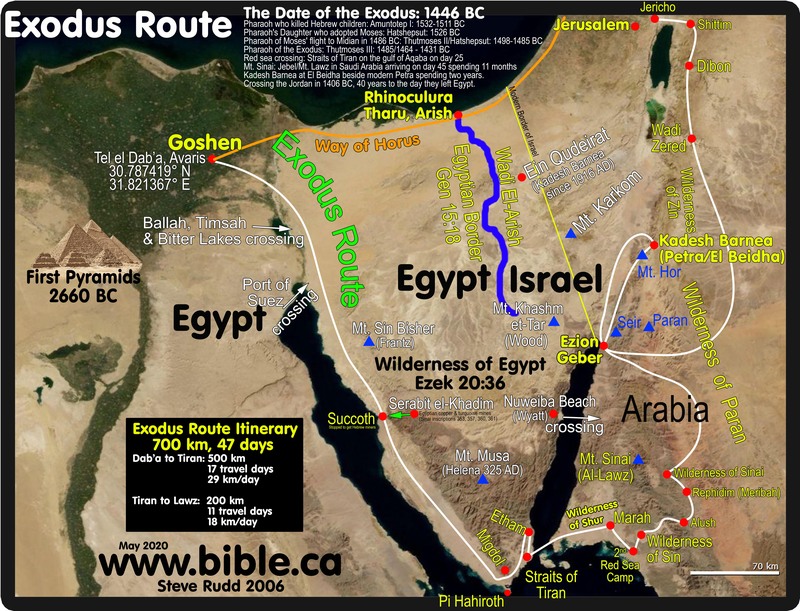 C. Succoth means: "block, stop the approach, shut off"
Since most of the exodus names were given by the Israelites as they traveled, this name obviously refers to a place that would "block, stop the approach, shut off" easy access by the Egyptian army. The 290 km coastal plain on the east side of the Gulf of Suez is flat and wide except for the 16 km section of medium difficulty, hilly terrain. Israel camped on the southern side of these low mountains on the coastal plain that continues to the crossing point. 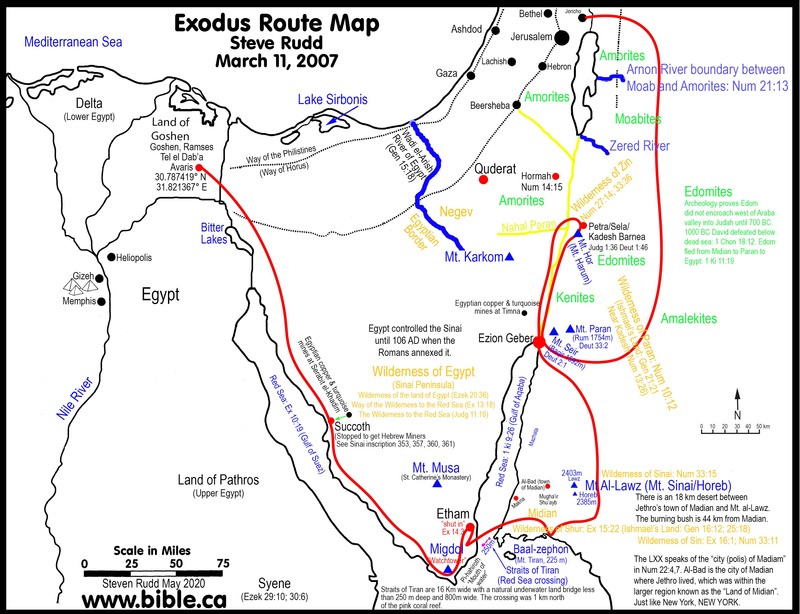 The Hebrews would feel protected from the Egyptians when they stopped here because the difficult terrain to the north would slow down the army. 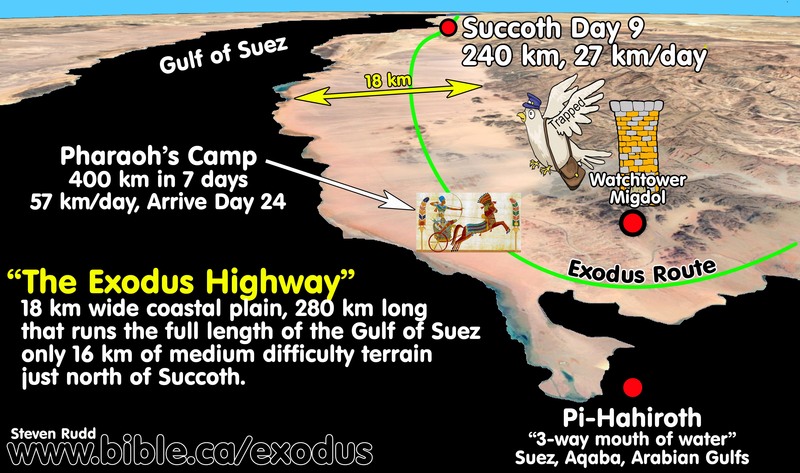 This is why they called it Succoth: "block the army, stop the approach of the army, shut off from Egypt"
In the traditional exodus route, Succoth is always placed west of the modern Suez Canal. For a crossing at the Bitter lakes, Succoth would be the first stop from Goshen. But since Goshen is only 30 km from the Bitter lakes it is doubtful that such a location could even exist, given the fact that the Israelites may have populated right up to the largest fresh water supply apart from the Nile. There just is not enough space. Given the fact that the land is flat and easy to travel over, there is no place that could be considered "block, stop the approach, shut off" from Egypt. Any location of Succoth, west of the Suez Canal makes no sense as a place of temporary security form Egypt.